This files contains 5 Spinners Games to help kindergarten and 1st grade students learn their sounds. Each spinner combines a short vowel with different consonant including double ending ones such as "ll" and "ss". 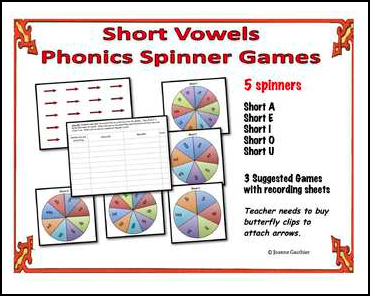 Also included are arrows for constructing the spinner and 3 suggested games and handouts for the games. Teacher must buy butterfly pins to construct the spinners. Short Vowels Word Work a variety of worksheets practicing mostly CVC words plus some longer short vowel words. Complete Phonics Word Wall Contains over 900 words organized by word families and spelling patterns.